Workers of the JD(S) tell Muslim voters that the BJP’s compulsion to ally with it will keep Hindutva in check. Since 2014, small parties and independent candidates have been getting short shrift in state elections. The number in the “others” column has been shrinking as a rising BJP makes politics more bi-polar, state by state. It is with this assumption that Berkeley scholars Rahul Verma and Pranav Gupta have argued that the JD(S) is a sinking ship, and may not get to even play king-maker in this election. However, a trip from Bengaluru to the Old Mysuru region reveals how deep-rooted the JD(S) is, even if it is in just one of the state’s six regions. H.D. Deve Gowda will be king, not king-maker, insist the party’s supporters. Their party, they know, won’t sweep the state with a clear majority. But the party is kept alive by the perception that the JD(S) and the BJP could come together. In this region, the BJP is so absent that you might forget it’s the dominant political force in India today. The opponent of the Congress here is the JD(S). The Congress and the JD(S) haven’t been the best of friends. After all, Congress’ chief minister Siddaramaiah left the JD(S) because its leader, former Prime Minister Gowda, chose to promote his son, H.D. Kumaraswamy. Kumaraswamy was chief minister for 17 months in 2006-07, with support from the BJP. As part of a power-sharing agreement, the JD(S) and the BJP would occupy the chief minister’s chair for 20 months each. While both Kumaraswamy and B.S. Yeddyurappa spent some time in the CM’s chair, it didn’t work out well, ending in President’s rule. In the Old Mysuru region, the Karnataka election seems to be a contest between Kumaraswamy and Siddaramaiah. With its weak candidates, a lacklustre campaign and ambiguous messaging, the BJP is happy to encourage the sense that it is likely to tie up with the JD(S) in the event of a hung assembly. What will happen eventually depends on the numbers – and there are all kinds of possibilities. For now, it is the sense of possibility that keeps the JD(S) alive. It is not the BJP or the Congress, but the JD(S) that everyone’s looking at. Every seat the JD(S) gains is a loss for the Congress, and thus a gain for the BJP. In the war of perceptions that any election is, the one that prevails also becomes reality. The perception that this party is going to be number three should have thrown the JD(S) out of the playing field. Ironically, the pregnant expectation of a hung assembly keeps the JD(S) embryo alive. People say it’s a waveless election, a close contest, a complex election and so on. Perhaps there is a hawa — the hawa of a hung assembly. The perception that a hung assembly is likely might just result in one. The irony is, the JD(S) brass insists the party is going to win a majority on its own. To do so, it needs Muslim votes too. So, JD(S) workers go around telling Muslim voters that the BJP’s compulsion to ally with the JD(S) will keep Hindutva in check. The JD(S) says it won’t support the BJP or the Congress. The new narrative it is spreading among voters is that it will be up to the BJP and the Congress to compete with each other to offer support to the JD(S). That is how the party says it is fighting to be king, not king-maker. For BJP supporters, this makes sense too, since Yeddyurappa is no longer enthusing voters. That he is nearly 75 years old makes people think the BJP doesn’t have any intention of seeing him in the chief minister’s chair. Who’s winning the election? “Kumaraswamy,” said a voter in Bengaluru. Is he a JD(S) supporter? No, he’s a BJP supporter but expects a JD(S)-led government. For the BJP, it makes sense to quietly support Kumaraswamy as the party needs to do a lot of work on the ground to prepare for the big one in 2019. The Congress is ready with its own strategies to not let Amit Shah walk away with the Chanakya award. A lot of cash could exchange hands. In Mysuru, Gowda lambasted the Congress party Monday, especially targeting Muslim voters to prevent them from going to the party. He ridiculed Rahul Gandhi and predicted the demise of the Congress in the state. “What could the Congress do about the 2002 riots?” he asked. He took Ghulam Nabi Azad’s name again and again, warning voters to not be fooled by the Congress’ rhetoric. While he says he won’t join hands with the BJP, his line on secularism seems to match Asaduddin Owaisi’s more than the Congress’. In questioning the Congress’ commitment to secularism, is he signaling something to the BJP? The only problem is, like Narendra Modi, Gowda also has one eye on 2019. He will turn 85 next week, but still dreams of becoming Prime Minister again. KCR from Telangana, Owaisi from Hyderabad and Mayawati from Uttar Pradesh have already extended their support to the JD(S) for the Karnataka assembly election. They want him in their Federal Front for that upcoming game of Kaun Banega Pradhan Mantri. Will Gowda sacrifice his Delhi ambitions for his son? Or will he choose to do business with the known devil, the BJP? 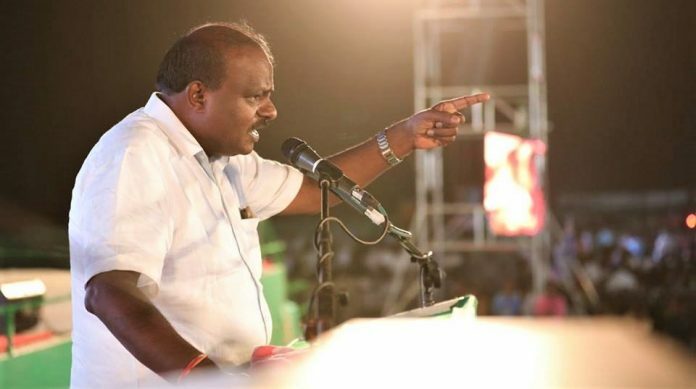 Could Kumaraswamy defy his father? Or is it all about money, anyway? In a state where stable governments are aberrations, conversations about the elections revolve more around the JD(S) than the Congress, or the BJP.